WRHU has the largest radio news team on Long Island. Over 75 student journalists research, write, produce, and broadcast news from studios in the Lawrence Herbert School of Communication. Student journalists also go out into the field to cover breaking stories and travel to many places across the country to cover special events. Student journalists meet, interview, and network with many newsmakers and celebrities. 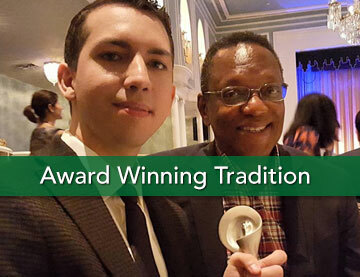 At WRHU FM student journalists frequently win prestigious awards from: Associated Press, Society of Professional Journalists, RTNDA (Radio TV News Directors Association), Sportscasters Talent Agency of America, Hearst, TALKERS Magazine, Press Club of Long Island, Fair Media Council of Long Island, and Collegiate Broadcasters Inc. Most importantly WRHU student staff polish skills at Hofstra. Many move on to places like: CBS News, ABC News, NBC News, Fox News, News12, ESPN, CNN, 1010 WINS, CBS 880 AM, NY Daily News, NPR, and other news organizations. Ed Ingles -WRHU Professional-In-Residence - Over 40 years experience in news and sports in New York City radio. This includes 24 years as Sports Director at WCBS AM 880. Ed also was a NY Jets NFL football and St John's college basketball broadcaster for many years. In addition he appeared on the CBS TV NFL pre-game show numerous times. Ed works extensively with the WRHU news and sports department. He also was a key player in developing the WRHU women's issues show "A League of Our Own." John Mullen - Director of Operations / Professor. For over 25 years, John has been involved in radio program management. Before joining Hofstra, he spent 4 years as Operations Manager of KISS FM and CD 101.9 in New York City. His other career highlights include: serving as Program Director of CD 101.9, Research Director of Hot 97 New York City, and a year as Interim Program Director at WBLS FM New York City. He also served as Assistant Program Director at WBLS. Mr. Mullen has programmed online music channels at vh1.com for MTV's Digital Music Networks and served as Long Island Bureau Chief for Metro Networks / Shadow Traffic. He began his radio career working in program and research management at WNEW AM. More recently, John Mullen has helped invent the worlds first nationally syndicated classic rock mash-up mix show "Rockmixx" with his partner DJ extraordinaire Rafe Gomez and John also serves as the Executive Producer of Hofstra's NY Islanders NHL radio broadcasts. Bruce Avery - WRHU General Manager and TV Meteorologist. For over 25 years Bruce has helped polish the skills of many broadcasting professionals. He has also served as an on-air TV meteorologist in New England and on Long Island (where he can be seen on News 12 Long Island). Bruce works with students on many levels and is available to work with students interested in pursing a broadcasting career in weather forecasting. Mario Murillo - Hofstra Audio Radio Program Department Coordinator and host / producer "Wake-Up Call" WBAI FM NYC. Produces for many radio outlets, including WBAI FM and WNYC FM. Mario is a former New York correspondent for "Latino USA!," National Public Radio's weekly news magazine for and about the country's Latino community, broadcast nationally on more than 200 public radio stations. Mario teaches many classes in radio programming, production, and theory. Dennis Quinn - The newest member of the Radio hofstra University family. Dennis is best known as the "Iron man" of New York City radio after spending 37 years as a full time on-air personality on one frequency 101.9 in the most competitive radio marketplace in the world (This is a record that will NEVER be broken) . Dennis was an on-air fixture at WPIX FM and CD 101.9. Before joining the Hofstra team, Dennis taught at Yale. John Bohannon - Community Volunteer and WRHU Air Talent. Over 30 years as a radio network news anchor at ABC, CBS, and NBC (where he was a newsperson on the Don Imus show). Besides working in radio, John is also a well-known magician and published author with works featured in Newsday, New York Daily News, and Saturday Evening Post. John conducts free news writing workshops for students. Alumni. 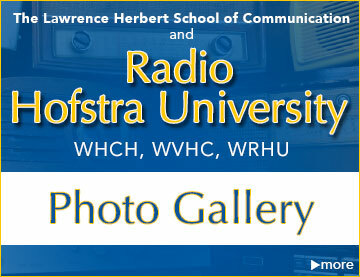 Radio Hofstra University has been in existence for nearly 50 years with thousands of alumni working in many radio and TV newsrooms all over the world. WRHU hosts numerous events throughout the year where alumni and current students network. 1010 WINS morning drive anchor Lee Harris, NBA TV anchor Jared Greenberg, WOR AM Sports Zone Host Pete McCarthy, and others frequently visit WRHU to speak with students and / or invite students to their broadcast location for tours and more. This powerful mix of in-house professionals and visiting alumni ensures a rich experience for students at Hofstra pursuing careers in broadcasting. WCBS TV New York City operates their Long Island Bureau in part of the Radio Hofstra University main office. the WCBS TV Long Island Bureau Chief, reporters, and other WCBS TV News employees frequently interact with Hofstra students. Students at Hofstra get a daily view of how a successful major market television news organization operates a local news bureau. The bureau is also a resource for student reporters working on Newsline (The WRHU award winning daily half hour timely local news show). WRHU airs a 30-minute live news show weekdays at 5:30 p.m. Newsline models its format in many ways to be like formats used by successful all news radio stations such as WCBS 880AM and 1010 WINS New York City. Headlines, breaking news, local stories, feature packages, weather, traffic, sports, entertainment, business interviews with newsmakers and more are all included in each Newsline broadcast to give students the feel for what it is like to work for an all news radio station. Students gain valuable experience researching, writing, organizing sound bites, stacking stories, and broadcasting on-air in a fast-paced, deadline-driven live broadcast environment. 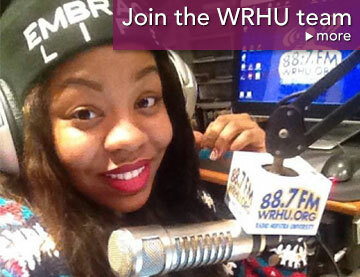 WRHU reporters cover local stories and stories around the world. Out in the field WRHU student news staff learn how to: act as a professional member of the press, cover press conferences, enterprise stories, acquire natural sound, set up / operate remote broadcasting equipment, interact with newsmakers and the public, and much more. 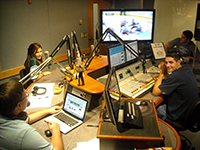 In the numerous WRHU studios, students use state-of-the-art news-gathering software including Associated Press (AP) Newsdesk. Student reporters broadcast from numerous campaign headquarters throughout New York City and Long Island. 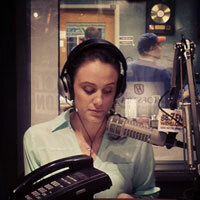 On the air, WRHU News provides deep coverage of local races. 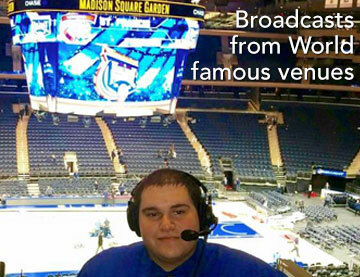 WRHU has a long history of developing outstanding sports journalists and sports broadcasters. 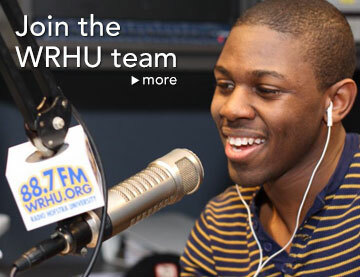 WRHU offers many outstanding unique opportunities for students interested in sports journalism. As early as freshman year, it is possible to get hands-on experience behind the mic broadcasting one of our many sports games or talk shows. WRHU student sports department staff broadcast over 100 Hofstra Pride sports games per year on WRHU FM, WRHU.org, WGCH AM, and GoHofstra.com. Student broadcasters do play by play and color analysis for Long Island Ducks Baseball broadcasts on WRHU FM and WRHU.org. 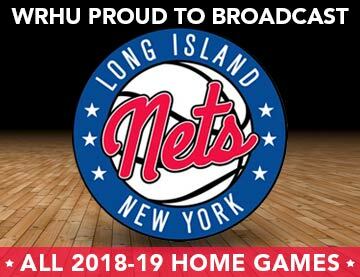 WRHU students produce and broadcast New York Cosmos NASL live game broadcasts. 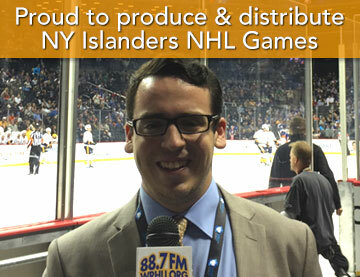 And the WRHU sports department is world famous for engineering, producing, and performing on-air roles for over 390 NY Islanders NHL games over the course of five NHL seasons.